Good: Stephen Strasburg 1st Bowman Auto, Team USA Cards, Bryce Harper 1st Bowman Chrome card, One of the best bang for you buck products of all-time, Jason Heyward Auto, Future's Game Triple Relics numbered to 99, Excellent chrome card design. Bad: Veteran base cards aren't very appealing, a few odd combinations in the "Expectations" insert, Orange refractors are ugly, hard to find a box to demand. 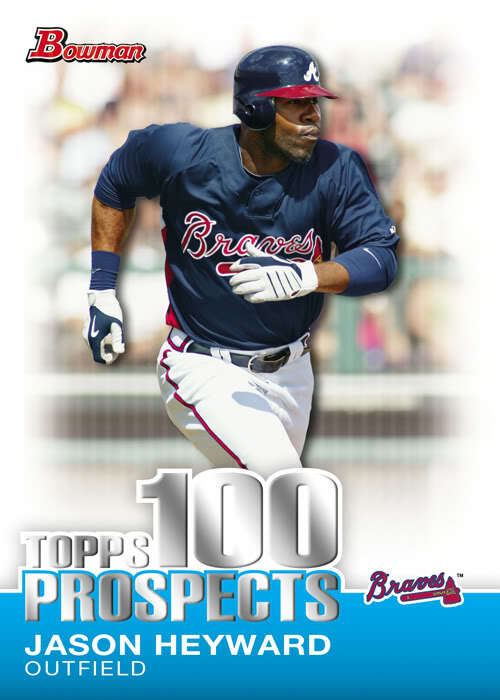 Bottom Line: I think there's a chance that 10 years from now, we may look at 2010 Bowman as the product that saved baseball cards and the hobby as a whole. 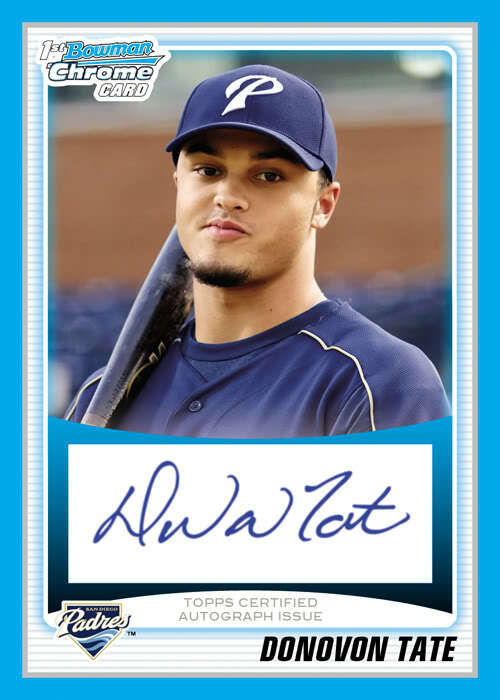 A combination of Topps getting the exclusive MLB, MiLB, and USA Baseball licenses, and perhaps the greatest rookie class of all-time seems to have created the perfect storm. Here's the bottom line, never in the history of modern sports cards has a product offered a return on investment that even comes close to rivaling 2010 Bowman. It hasn't even been out for two weeks and there have already been atleast 10 cards to sell for over $1,000 on ebay and hundreds to sell for over $100. This is a $5 a pack product we are talking about, not Exquisite Collection! 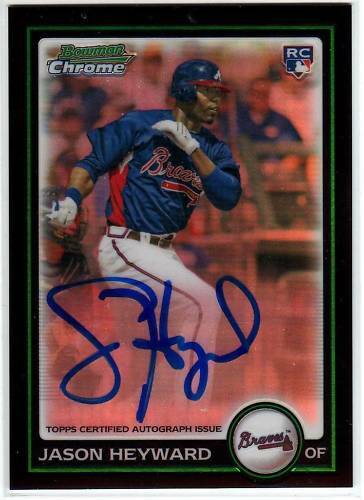 The card design of the Bowman Prospects / Bowman Chrome Prospects is among Bowman's best. The light blue color theme that is incorporated into the prospect cards creates a classic look to the futuristic card design. 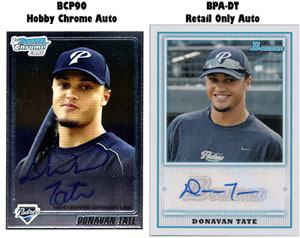 I also liked how they switched it up and used a white border on the chrome prospect auto's. 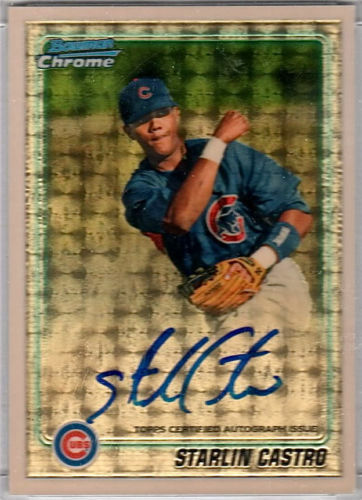 The base card design used for the veterans and 2010 rookies is not very appealing, but after seeing the Chrome base rookie auto's, the base cards will translate to chrome nicely. The checklist is utterly stacked! Heyward, Strasburg, Ackley, Tate, Castro, Chapman, the list goes on and on. They even found a way to fit guys like Mike Stanton, Desmond Jennings, and Michael Moustakas into the product! Then when you figure in the Team USA cards, you add Bryce Harper and a who's who of the upcoming 2010 MLB Draft. If you are a prospector or rookie collector, this checklist is the type of checklist that dreams are made of! 2010 Bowman is the most valuable mid-level product I have ever opened. Simply put, $5 per pack/$15 per jumbo pack products don't have cards in them that sell for thousands of dollars! There is a Stephen Strasburg Superfractor up to nearly $10,000 on eBay and there is still 4 days left in the auction! Even the worst 2010 Bowman Box possible is still a great box. If I could give the value of this product a 10/5 I would, but that's not how review systems work. This is one of the most enjoyable products I've ever opened. 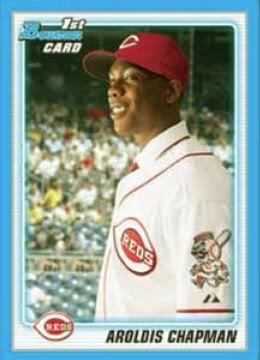 Prospecting has never been better than 2010 Bowman. The one thing I would highly recommend is ripping a Jumbo box instead of the standard 24-pack hobby box. The Jumbo is where the $1,000+ cards are. 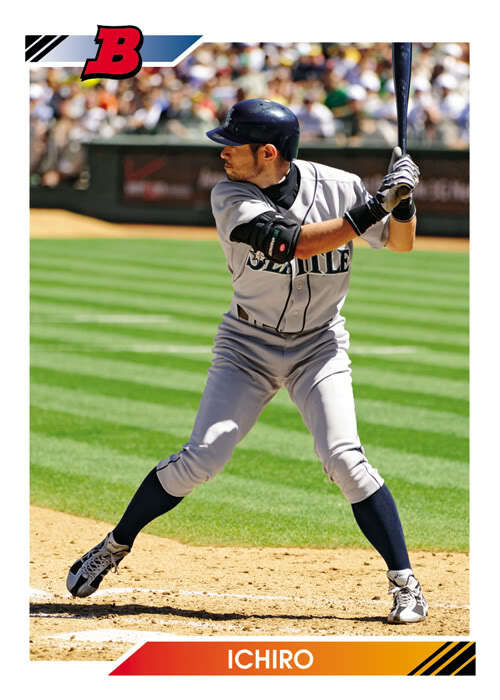 Either way, if you enjoy baseball and baseball cards, you will love this product. 2010 Bowman Chrome HOBBY Box (Bryce Harper Francisco Lindor Manny Machado Auto)? 2010 Bowman Baseball Blaster Box, sealed, Possible Strasburgh auto RC, Arenado ? 2010 Bowman Sterling Baseball Box 3 BOX LOT Stanton RC, Sale RC? 39 AUTOS! 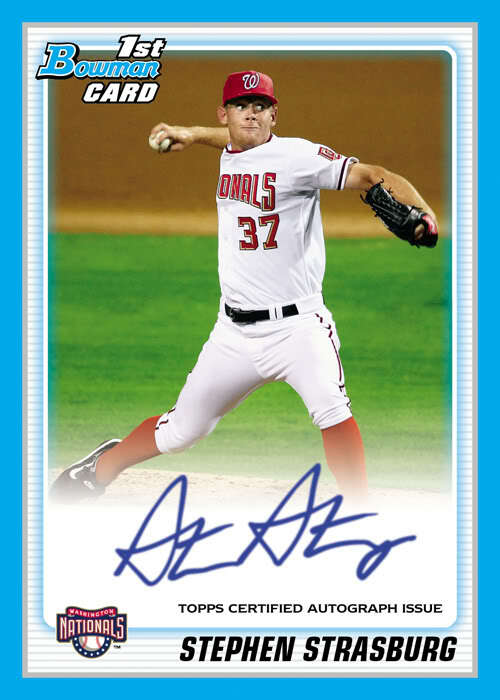 Autographed cards of Stephen Strasburg, Jason Heyward, Starlin Castro, Dustin Ackley and other big time 2010 MLB rookies and prospects, as well as 1st year cards of Top Draft Picks like Bryce Harper, Jameson Taillon and Manny Machado. Every Hobby Box guarantees 1 Chrome Autographed Prospect. Every Jumbo Box guarantees 3 Chrome Autographs (1 prospect autograph and 2 rookie autographs). Inserts: 1992 Bowman Throwback (100 subjects), Topps 100 Prospects (100 subjects), Bowman Expectations (50 subjects), Triple Relics (37 subjects), Prospects (110 subjects), Bowman Chrome Prospects (110 subjects), Purple Refractor Parallel #'d to 999, Refractor Parallel #'d to TBD, Blue Refractor Parallel #'d to 250, Gold Refractor Parallel #'d to 50, Orange Refractor Parallel #'d to 25, Red Refractor Parallel #'d to 5, Super-Fractor Parallel #'d 1/1 (hobby only), Printing Plates #'d 1/1. God looking on-card auto’s with some big names! That’s all I ask for. Great set of cards. My 7 yr old son loves them!!!!!!!!!!!!!! !